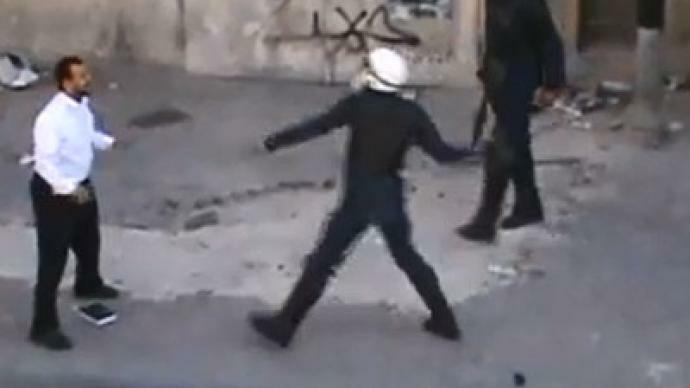 The death of a teenage boy during the violent second anniversary of Bahrain’s popular uprising drove one enraged protester to face down riot police in a dramatic scene caught on film. Through the haze of smoke in the debris-littered streets of Daih, over half a dozen riot police were met with a volley of screams by an unidentified protester who was overwhelmed after witnessing the death of Hussein Jaziri – a teenager killed by shotgun fire on Thursday. 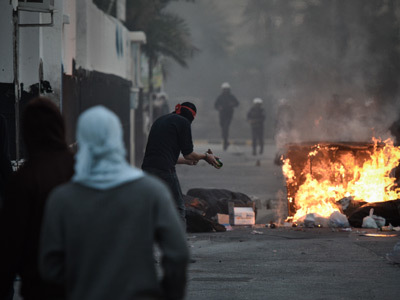 The tense standoff in the predominately Shiite village outside the capital Manama seemed likely to end in violence, though the pure force of the protesters indignation reportedly had police rattled. “You criminals! You murderers! You hope to escape God’s wrath? God will avenge us! Go on, shoot me! Shoot me if you dare, I won’t leave,” the lone man belted out with raw conviction as he closed in on the officers. A masked youth tentatively approached the man and attempted to pull him back without effect. His screams only intensified as the first officer approached and immediately recoiled as a rock struck the nearby pavement. A second officer charged in with his baton but immediately lowered it when the demonstrator refused to flinch. Projectile-lobbing protesters then forced back police, who responded with tear gas. The scene has served to highlight the opposition’s resolve despite the government’s hardline response to the ongoing unrest which has gripped the Gulf country for two years. Nationwide protests were organized by opposition activists on Thursday to mark the uprising’s two-year anniversary. Protests soon turned violent, with security forces firing shotguns and tear gas to disperse the demonstrators, who then responded by throwing Molotov cocktails. Clashes raged on into the early hours of Friday, with one police officer reportedly being killed after being hit by “an incendiary device,” the interior ministry said. On Friday police used sound bombs to disperse thousands of opposition supporters who staged a mid-afternoon demonstration on the Boudaya highway, which links several Shiite-populated villages with the capital, AFP cites witnesses as saying. The demonstrations held Friday were not forbidden and were in fact issued a permit, Bahrain’s information minister Samira Rajab has told RT. The violence erupted, according to the minister, when the crowd violently took to the streets violating the mandated course of the demonstration. To protect order, the government had to respond with force. Continuing on the topic of clashes, the minister stressed that it stems from the groups on the streets. 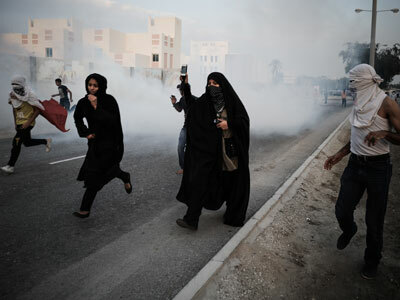 “Our problem lies in violence, as the crowd resorts to violence in Bahrain, we can’t be silent seeing this. It is because of them that the country as a whole is suffering destabilization among the society in general,” Rajab says. “The opposition is inventing the news, and the whole world listens to them because they are the opposition, and people are used to listening to them as a legitimate source. As a result of these clashes, one policeman has died and dozens of others injured,” Rajab says. 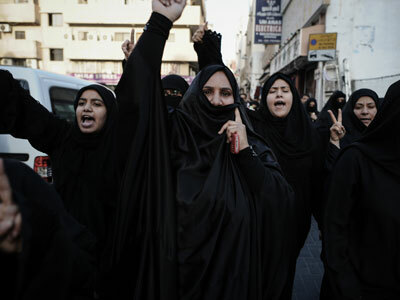 Bahrain, a country where over 75 percent of the country is Shiite, is ruled by a Sunni monarchy. 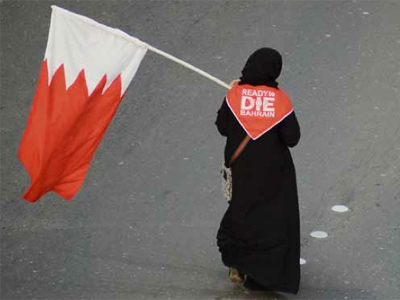 On February 14, 2011, thousands of protesters took to the streets of Bahrain's capital, Manama, demanding democratic reforms and the resignation of PrimeMinisterSheikh Khalifa bin Salman al-Khalifa. Since the start of the uprising, at least 82 protesters have been killed, including nine children.